Earlier on Tuesday, it broke that the Mariners had hired Lloyd McClendon as their new manager. The day before, the Mariners gave Kendrys Morales the $14.1 million qualifying offer. The departure of Eric Wedge has been covered and really, what does it matter at this point? It happened, and now we have Lloyd McClendon to dissect on a strategic level to make ourselves feel better. How much of an impact will McClendon have and is Morales worth $14.1 million? I can safely say, we'll definitely discuss it. Whether or not we reach any conclusions is still kind of up in the air. We'll find out together! First off, the McClendon hiring. 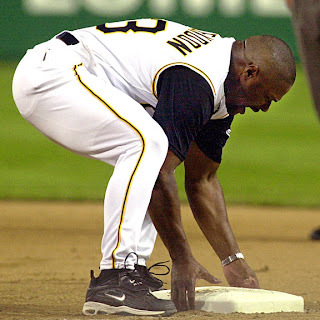 Previously, he was the manager of the Pittsburgh Pirates from 2001-2005, compiling a 336-446 record and most famous for this tirade while with the Pirates. None of this says anything about McClendon as a manager. The Pirates were horrific in those years and, as Mariner fans can attest, the record reflects more on the team than the manager. Granted, a manager's strategic decisions can cause a team's loss or secure a win, but how often in a season? The manager can't hit, pitch or field, so the onus is on the players to not screw the pooch. Jim Leyland is a fan of Lloyd McClendon, which should be all you need. If the Mariners still manage to lose 95+ games next season, we can pick apart McClendon's decisions all we want, but he's not the one that lost those games. He may have caused a few, but the blame will rest on the front office yet again. Speaking of the front office, it was reported by Geoff Baker that McClendon had received a multi-year deal in anticipation of Jack Z also receiving a multi-year extension beyond 2014. My first reaction, and my only reaction really, was "What in the bloody hell?" What I don't understand is what has Jack Z done to earn another extension? He's added a bunch of talent to the farm system and kept it fairly deep. The major league team is where he has failed spectacularly. The depth of the farm system doesn't do much good when you develop major league average players and lower and supplement those players with 35 year old veterans on their last legs. If this offseason, Jack Z becomes equally desperate to improve the team, you can say good bye to the farm system. Last season, Nick Franklin and Taijuan Walker were two of the major pieces that would have brought Justin Upton to the Mariners. I can only imagine what'll happen this offseason and I'm about ready to scoop out the creative side of my brain so I can stop imagining. Next up is Morales. If you're not sure how the qualifying offer works, there are articles out there that can explain it better than I. The article I linked to is from last season, so the $13.3 million average mentioned is up to $14.1 million this year. To give a quick rundown, if Morales accepts the offer, he'll be under contract to the Mariners for the 2014 season at $14.1 million. If he rejects it, he becomes a free agent and if any of the other 29 teams sign him, they lose their first round pick if their first round selection is after the 10th overall pick. First off, is Morales worth the $14.1 million he'd receive if he accepts? Maybe. He's basically a DH only hitter with some power and is pretty slow on the base paths. Pretty slow may be giving him too much credit, but its hard to care in November. That being said, the value is based more on supply and demand than how much money you spend per win for a player. While you will obviously pay a higher premium for higher WAR players, the market changes year to year. What's $14 million this season wasn't $14 million 10 years, or even 5 years, ago. For a team in desperate need of offense in a weak free agent market, its not completely crazy to think that paying $14.1 million to Morales would be an indulgence for the Mariners. The thing about Morales is that his agent is Scott Boras. If he accepts the qualifying offer, I'll sit down to a big ol' plate of year old Nike shoes. Boras is infamous for turning down those types of deals in an attempt to get his client the most money and years possible, to the point of getting teams to bid against themselves. With the qualifying offer being implemented last season, Kyle Lohse turned out to be an example of what could happen to a player that turns down the qualifying offer. Even so, with as desperate as Jack Z is, it wouldn't surprise me in the list if Morales turns down the offer, the Mariners bid against themselves and overpay him by the time February rolls around. Thus begins the 2013-2014 offseason for the Mariners. There are free agents out there they may pursue and trades that could go down that nobody will be happy with. Even so, the Mariners have a new manager that might or might not help, but provides fresh meat for the meat grinder that is Mariner fan's hopelessness and criticism of everything related to the team. Morales is still a question mark, but at least we know that Jack Z will probably be at the wheel for a while longer. Embrace the horror.